I hope you will enjoy the new content I have added. This site is not just a display gallery for my work, it now offers a complete guide to my painting life and most importantly for the many artists who visit me, it is a guide to how I produce my paintings. In the twenty years that I have had my business online, I have learned a great deal about what interests people most and I have made every effort here to build a website with something for every visitor. Wildlife Art is obviously my forte, but I also enjoy painting a wide variety of other subjects such as Space art and portrait painting and these paintings can now be seen in the new 'Other Subjects' gallery. Artists wondering how I produce my paintings will enjoy the new Learn from me section where they can browse paintings at various stages of completion and view details of my latest instructional painting DVDs. These offer a complete guide for how to paint wildlife. I am happy that my work inspires a new generation of up and coming Artists, and for them I have added here a specialsection where I show my very earliest works which will help them gain confidence that they too, if they work hard, might one day become a professional Artist. Young people may ask their parents to submit their paintings to me, and I will showcase them on this page for all to enjoy. The all new 'About Eric Wilson' section contains a huge gallery of photographs covering my professional career. Last but not least, the 'Art for Sale' section for collectors of my work, makes purchasing an original or fine art print a simple and reliable process. Wildlife art paintings for sale are displayed there. Thank you for your visit here and please come back soon as I will regularly update this site with new work. ‘Edge Of Darkness’ -White Wolf. Pastel. Snow Leopard in Pastel 19x 16 inches. ‘Brother’ Sumatran Tiger and Asian Giant Hornet. Pastel. 21.5 x 18 Inches. My thinking behind this painting was the observation that hornets and wasps are the tigers of the insect world. Apex predators, fearless in their domain and like the tiger, wearing stripes to display their status to all around them. I imagined a fleeting moment in time, where these kings of different worlds come face to face, and in that brief moment an understanding passes between them, an epiphany where each in its own way, gains insight into the nature of the other. A Portrait of my son Bjorn. Aged 10. Pastels 18 x 20 inches. 'Ghost' Pastel 100cm across. SOLD. 'Where Tigers Pray' Pastel. SOLD. 'Where Tigers Pray' is a painting I've had in my mind for many years and I'm happy that I found time to paint it over the Christmas period. 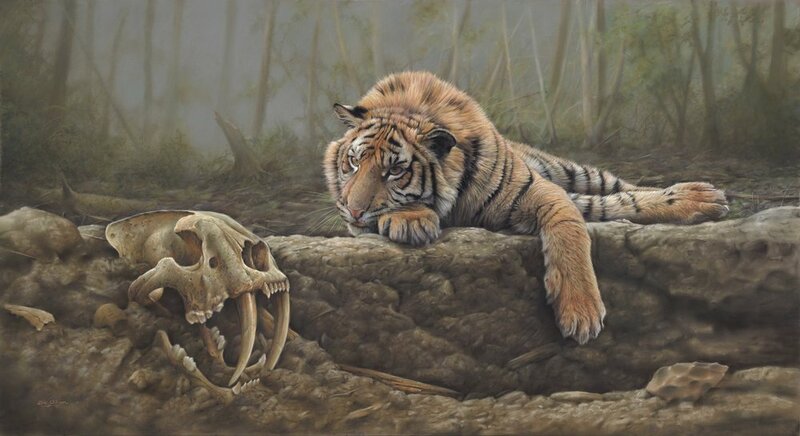 I imagined a tiger captivated by a strange artifact before him; The skull of an extinct sabertooth tiger that had been unearthed by an eroding riverbank. It was originally conceived with the title 'Or not to be' as a question mark hanging over the fate of all big cats past and present, but as the painting began to take shape the strong connection between the tiger and his long extinct ancestor began to take on a spiritual quality all of its own, and the ground upon which he lay, appeared to me to be in more of a secret, sacred place, an altar even, known only to tigers, and hence the title 'Where Tigers Pray' To enhance this feeling I gave the background forest a mystical, magical atmosphere. It is a fantasy piece, but I like that quality in a painting. I hope you do too. Black Panther. Oil painting. Original SOLD. 'Diego' Domestic Cat. Original SOLD. Pastel. 14 x 18 inches. Available. Sumatran Tiger. Oil on Linen 30 x 40 CM. Oil Painting of a friend. 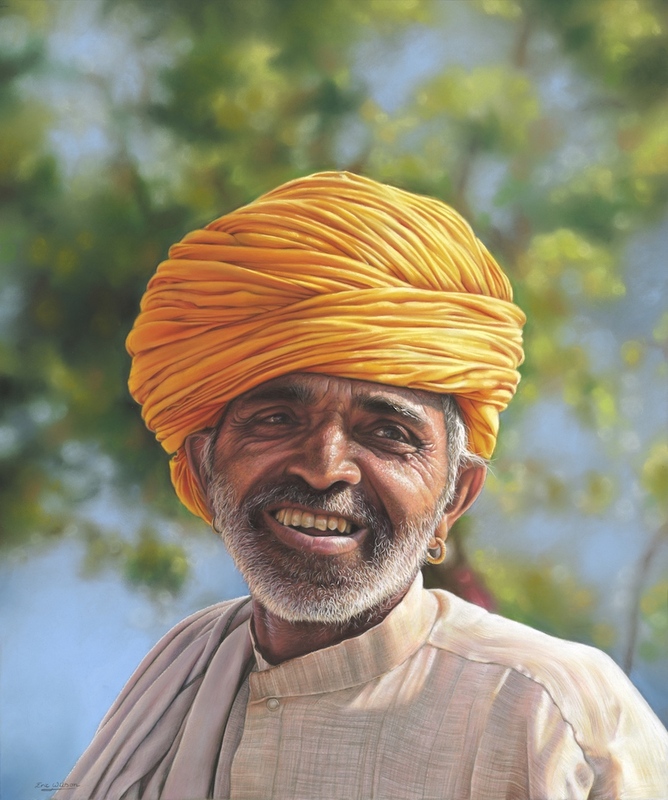 'Colours of Rajasthan'. Portrait in pastel. 19x23 inches. Polar bear cub at Wapusk. Pastel. Commander Dave Scott, Apollo 15, salutes the flag at the end of EVA 2 on 1st August 1971. Sumatran Tiger Cub with mother. Pastel - Original SOLD. Commander Dave Scott, Apollo 15, salutes the flag at the end of EVA 2 on 1st August 1971. Silver Spur and Mount Hadley Delta can be seen in the distance. Oil painting on canvas, 48 x 36 inches. The original photograph, from which I based this painting, was taken in black and white by Jim Irwin. It was a much larger scene which included the lunar Module. I concentrated upon the figure of Dave Scott for my painting, adding the colour and missing detail from the grainy black and white image, making this image unique in that it is exactly as it was on the moon, and yet improving upon the original image to give us a better appreciation of that magnificent moment. For more space paintings click here. Want to learn more about this Apollo space painting? How and why I created it? Sumatran Tiger cub with mother in pastel. Fine art prints are still available. I love to paint Sumatran Tigers. They have such expressive faces. There are now fewer than 400 Sumatran tigers holding on for survival in the remaining patches of forests on the island of Sumatra. Accelerating deforestation and rampant poaching mean this noble creature could end up like the now extinct Javan and Balinese tigers. They are precious rare creatures. I painted this tiger as part of a private tuition course in Vienna, Austria. 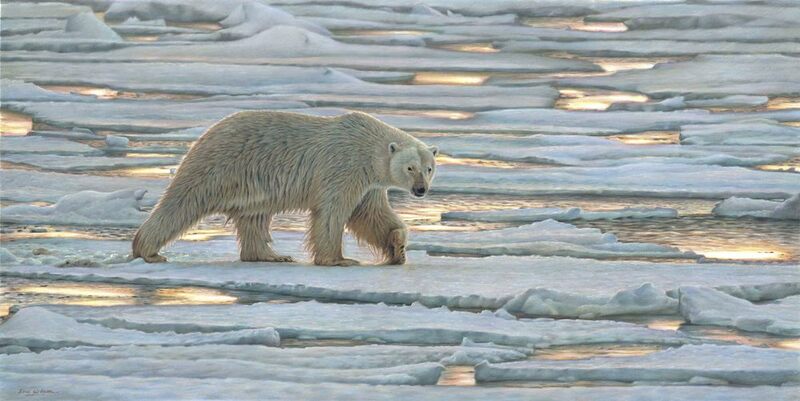 'Walking on thin Ice' Polar Bear - Wapusk, Canada. Pastel 13.5 x 27 Inches. Original SOLD. Walking on thin Ice Original SOLD. I consider myself very lucky to have actually spent time in the frozen north of Canada observing polar bears in their natural habitat. I saw this magnificent bear one morning in Wapusk, Canada. It was -30 degrees and he was swimming from berg to berg as though it was a heated swimming pool. It was so cold that to remove my hand from my glove long enough to take a photograph was an intensely painful affair, and yet there he was, perfectly adapted and happy. I was filled with admiration for this incredible animal. 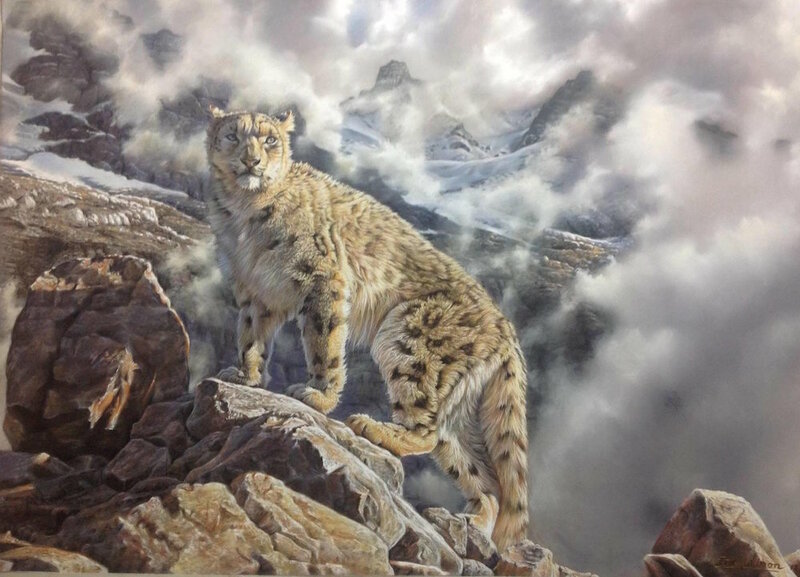 The original painting was on display at the National Exhibition of Wildlife Art. Sumatran Tiger Cub in Pastel by Wildlife Artist Eric Wilson. Pastel Art 12 x 10 inches. SOLD. Sumatran Tiger cub in pastel by wildlife artist Eric Wilson.Original artwork has been sold but fine art prints are available. Please contact me for details. Art instruction on DVD. How to paint wildlife in Pastel. In this DVD I take you through a complete painting, ( The elephant on the cover. ) from the first stroke to the last. It is a unique insight into how I work. 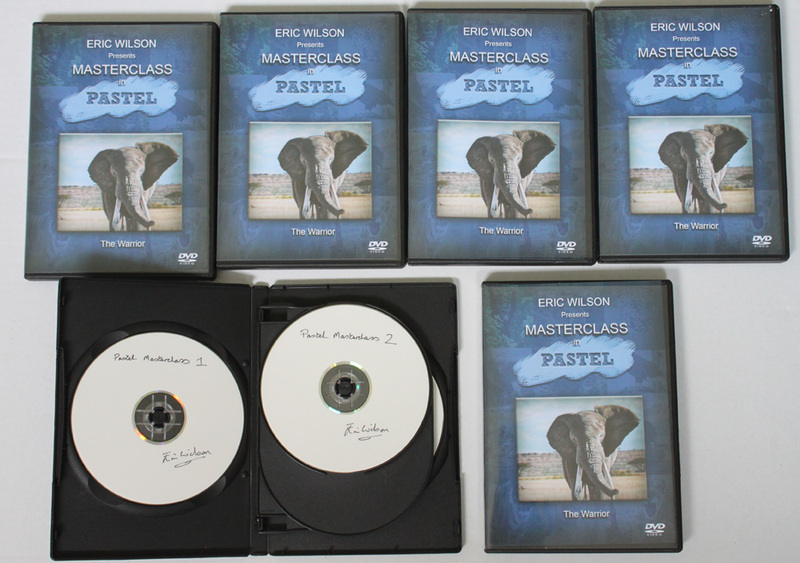 I am proud to offer this first instructional DVD and believe it will be a valuable aid to anyone wishing to learn how to use pastels effectively. 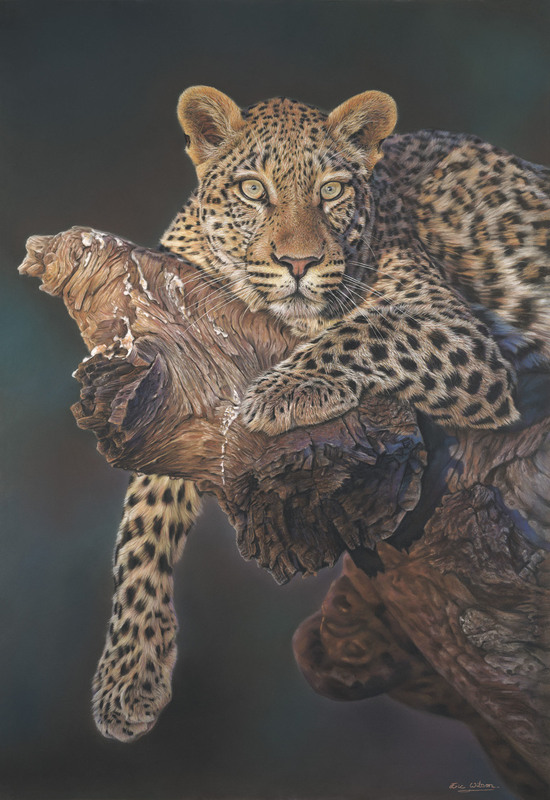 Wildlife Artist Eric Wilson is famous for his big cat paintings, painting of lion, painting of tiger, and painting of leopard being his specialty. 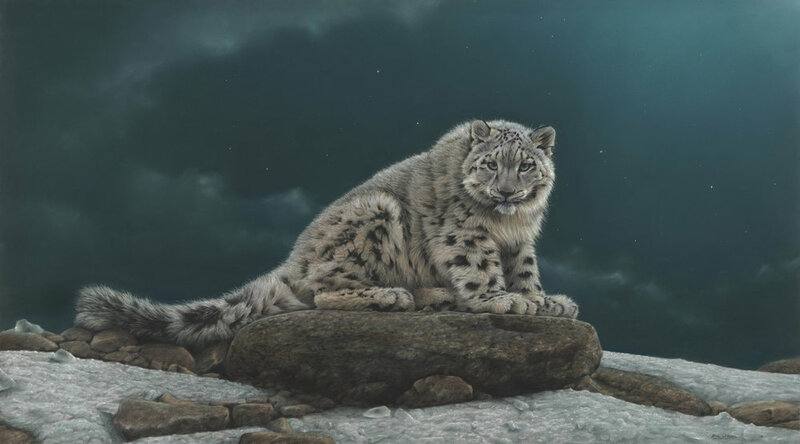 This website displays his award winning wildlife art and also his portrait, landscape and space art. Fine art Giclee prints are available for sale both on fine art canvas and fine art paper as well as original artwork. Instruction in art technique, oil painting technique, pastel painting technique and acrylic technique are all covered including step by step painting guides and instructional educational painting DVD sets.